Vinalines has set a goal to sell the six remaining ships of its subsidiary Vinashinlines by June 30, said a corporation official. 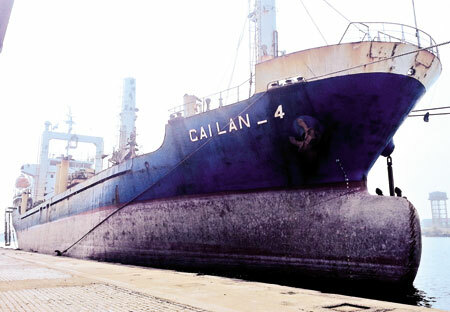 Nguyen Dinh Thanh, Deputy Director of Vietnam National Shipping Lines (Vinalines), said the ship New Phoenix, one of Vinashin Ocean Shipping Co Ltd. (Vinashinlines) was sold at USD3.7 milion on March 28, after being held in China for a long time. After the ship was handed over to the new owner, 15 sailors have been paid returned to Vietnam. He added that the remaining six ships held in Pakistan, China, UAE and India remain safe, and that there is sufficient water and food as well as fuel for the ships, which now accommodate 96 sailors. The biggest difficulty facing Vinashinlines is to pay off debts to material suppliers and repair stations. It is now seeking ways to have the debts restructured after selling ships as well as to unfreeze the ships as collateral at credit institutions. “The ships have been put up for sale and we aim to sell them by June 30 to pay the salaries of our sailors and return the country,” the official noted. If the ship sales fail, Vinalines will still try to ensure living condition for the sailors, sending new sailors to replace the old ones who would return to the country, he said. Although the Ministry of Transport and Vinalines affirm that they have ensured daily expenses for the sailors and to maintain ship operations, the sailors have still complained about the living conditions. He attributed this to the late shipment of supplies, not Vinalines breaking their promise. Vinalines has got a VND200 billion (USD9.52 million) loan from the government to support the sailors of the ships detained in foreign countries and liberate the detained ships. According to the Vinalines, if the maritime transport market improves, the ship sales will be quick. This entry was posted in Shipowner. Bookmark the permalink.